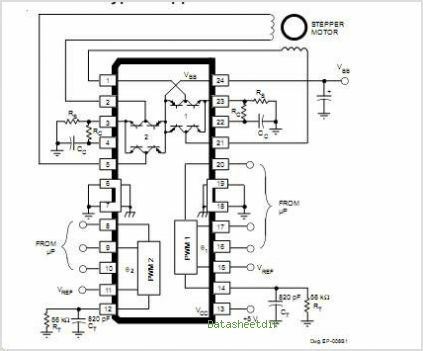 The L6219DS Motor Driver is designed to drive both windings of a bipolar stepper motor or bidirectionally control two DC motors. Both bridges are capable of sustaining 45 V and include internal pulse-width modulation (PWM) control of the output current to 750 mA. The outputs have been optimized for a low output saturation voltage drop (less than 1.8 V total source plus sink at 500 mA). For PWM current control, the maximum output current is determined by user selection of a reference voltage and sensing resistor. Two logic-level inputs select output current limits of 0, 33, 67, or 100% of the maximum level. A PHASE input to each bridge determines load current direction. The bridges include both ground clamp and flyback Diodes for protection against inductive transients. Internally generated delays prevent crossover currents when switching current direction. Special power-up sequencing is not required. Thermal protection circuitry disables the outputs if the chip temperature exceeds safe operating limits. The L6219DS is supplied in a 24-pin surface-mountable SOIC, with 4 internally-fused leads for maximum package power dissipation in the smallest possible construction. It is lead (Pb) free with 100% matte tin leadframe plating. By Allegro MicroSystems, Inc. This is one package pinout of L6219DS,If you need more pinouts please download L6219DS's pdf datasheet. 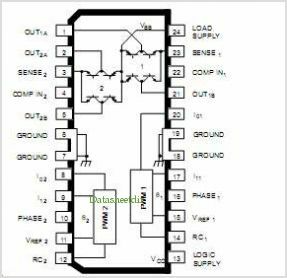 This is one application circuit of L6219DS,If you need more circuits,please download L6219DS's pdf datasheet.